Lady Rose Marine Services has kayaks and canoes available for rent for use in the Broken Group Islands and Pinkerton Islands/Sechart Channel area of Barkley Sound. All of our kayaks are fibreglass construction and are supplied by Seaward Kayaks. For equipment specifications please see equipment list below. We do not offer guided kayaking trips and we assume no responsibility for the level of experience or ability of our clients that rent our kayaks. All of our rental equipment is based at Sechart Whaling Station Lodge. The lodge is located about a 1/2 mile north of the National Park Boundary (Broken Group Islands) in Sechart Channel adjacent to Canoe Island in Barkley Sound. Transportation of passengers and camping gear to the lodge are available on scheduled sailings from Port Alberni and Ucluelet or by water taxi service from Toquaht Bay. Please visit our rates and schedules page for information about access to Sechart from Port Alberni or Ucluelet. For information on access from Toquaht Bay please visit our Sechart Lodge page. For our location in Port Alberni and for other travel information please go to the Contact Us page for details. All advance rental reservations and payments are made through our Port Alberni office. We will accept Visa and Mastercard credit cards to pay for and secure your reservation with us. Weight: 55 lbs., length: 17', width: 24.5", height: 15"
Weight: 105 lbs., length: 21', width: 30.5", height: 15"
All prices are in Canadian currency and do not include taxes. Passenger fares to Sechart Whaling Station Lodge are additional. First and last day of rental count as half a day each. Some exceptions apply. 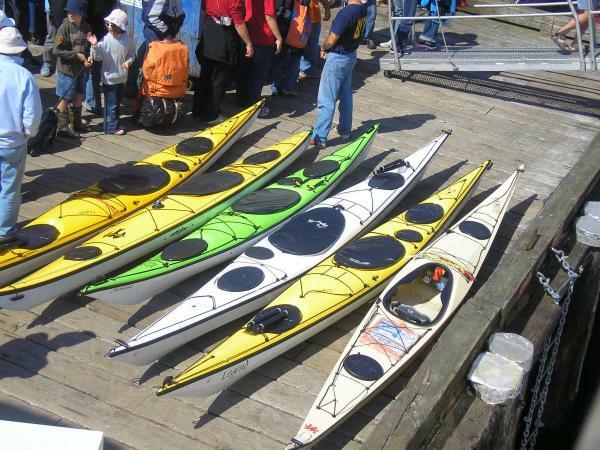 Rentals include personal flotation devices (children should bring their own to ensure exact fit), paddles, spray skirts, pumps and rescue lines for kayaks. Clients should bring their own compass and chart as weather conditions in Barkley Sound can change suddenly and unexpectedly. Charts are available for purchase in our Port Alberni office, onboard our ships or at Sechart Lodge. Rental clients are responsible for their own camping equipment and food supplies. Freight charges, if you are bringing your own kayak or canoe, are extra. For a two-person kayak or canoe the freight fee is $55.00 + GST. For a one person kayak the freight fee is $45.00 + GST. Freight rates are based on round trip passage starting from either Port Alberni or Ucluelet. If you are reserved for travel from Port Alberni to the Broken Group, plan on being at our dock in Port Alberni by 6:45 in the morning. If you are traveling from Ucluelet to the Broken Group, please be at the wharf located at the bottom of Main Street in Ucluelet by 1:00 in the afternoon on scheduled sailing days. From either location if you are bringing your own kayaks do not load any items in your kayaks as they are hand loaded on and off our ship. We will provide loading bins for your personal gear and camp equipment. The bins are about 4 feet square and 3 feet high so normally they can accomodate all of your items. Plan on taking your own drinking water with you into the Islands.There is no guarentee that you will find water on the islands, and water is not available at Sechart Lodge. You can fill your containers at our dock in Port Alberni before boarding the ship if you have not already done so. Camp fires in the Broken Group Islands are permitted along or below the high tide mark. Only drift wood can be used for making fires. Cutting of any vegetation for camp fire fuel, or for other purposes, is strictly prohibited. When camp fire bans are in place for the interior of British Columbia you may still be able to have a camp fire at your Broken Group Islands camp site since it is normally cooler and more humid on the coast. Enquire with the National Park (link below) for more information. At this time camp fires are permitted in the Broken Group. Camping occurs in one designated area only on each of the seven islands set aside for this purpose. Please not that the National Park has a maximum allowable group size of 12 persons traveling together within the Broken Group Islands. Also no pets are permitted. Know before you go: Please visit the CoastSmart website http://coastsmart.ca/ before you go. It features interactive experiences, safety advice and education while visiting the Pacific Rim National Parks. Camping fees are $9.80 per person per night. A valid Broken Group Islands camping permit is required for anyone camping in the Broken Group. The Broken Group Islands are now included the national reservation system for the 2019 operating season (from May 1 - September 30, 2019). 1. Reserve by phone: Call 1-877-RESERVE (1-877-737-3783). Available from 8 a.m. to 6 p.m. local park time. All visitors to Pacific Rim National Park Reserve (PRNPR) are required to have a valid national park entry pass at all times while they are visiting the National Park Reserve. The exception is youth (17 years of age and younger). They have free entry into all of Parks Canada's places. Important note: The Broken Group Islands Backcountry Camping Permits do not include the national park entry fees, so visitors will need to have a valid camping permit and a valid national park entry pass at all times. Notice of cancellation received by our office six weeks or more in advance of your reservation date entitles you to a full refund. Five to six weeks notice 75% refunded. Four to five weeks notice 50% refunded. One to four weeks notice 25% refunded. Less than one week no refund will be issued. A postponement of a reservation is deemed to be a cancellation. Reservations are not transferable to another period. To avoid a financial penalty we encourage our clients to consider purchasing cancellation insurance from a third party if you feel you may not be able to honor your reservation with us due to a medical emergency or other unforseen circumstance.